Once you purchase the pro version you will receive a download link for the pro plugin. You may also download the pro plugin any time by going to the Account section of this site. Upload the pro plugin using the standard WordPress plugin installer and activate plugin. Here are some step by step instructions. To only display links which are assigned to all selected categories, look for the widget option labeled “Only display links assigned to all selected categories”. This option is also available when using the shortcode by adding both_categories=”true” to any shortcode. 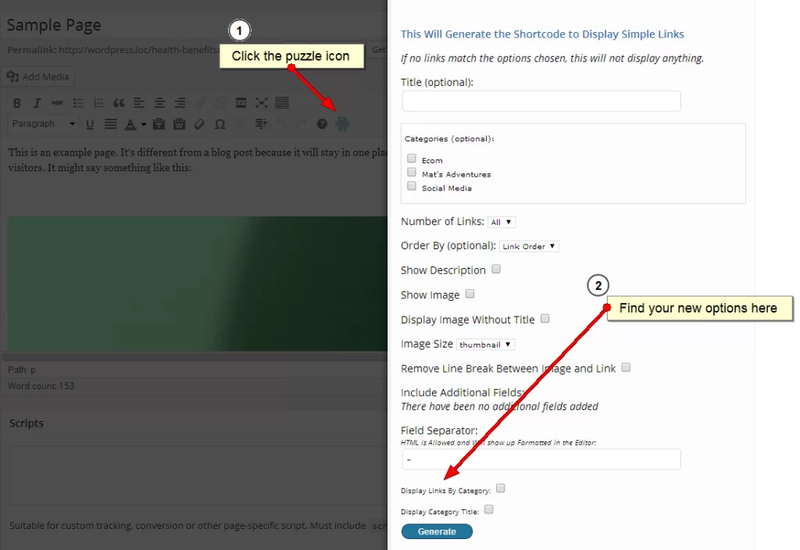 Visual shortcodes allow you see what you list of links will look like within your content. You may turn on this feature in Simple Links -> Settings. Once activated any use of the [simple-links] shortcode will display the actual list of links within the post/page content editor. You may still use the shortcode form to create the initial shortcode. You may edit existing shortcodes by hovering over the list of links and clicking the edit icon. Currently editing the shortcode does not give you the full editing form, but instead uses the basic “Insert From Url” field in the WordPress embed form. The options for this functionality are available using the short-code generating form. You may also enter them manually like so. 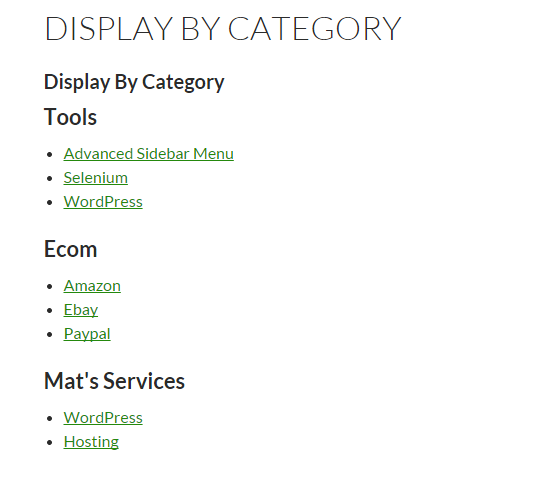 If the shortcode or widget has categories selected only the selected categories will display. If the “Number of Links” option is used, this will display the selected number of links per category. For instance if 10 is selected, each category will display 10 links. All other options work as normal. 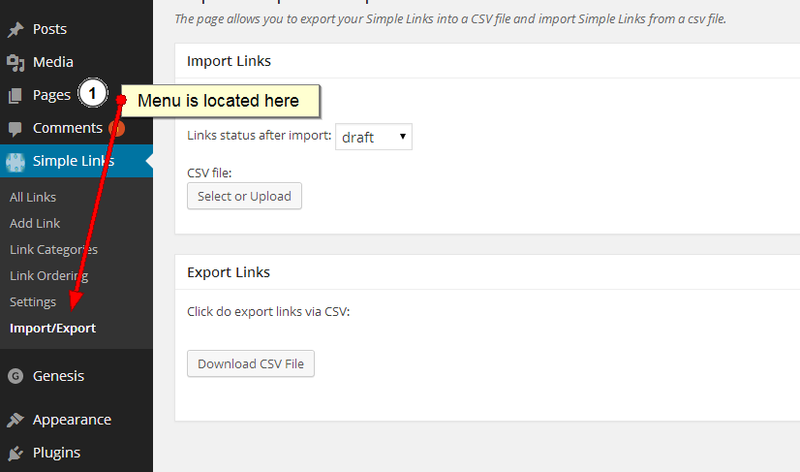 Once you have clicked on the Import/Export link you see find a very easy to use page. To export your existing links use the button next to arrow number 1. 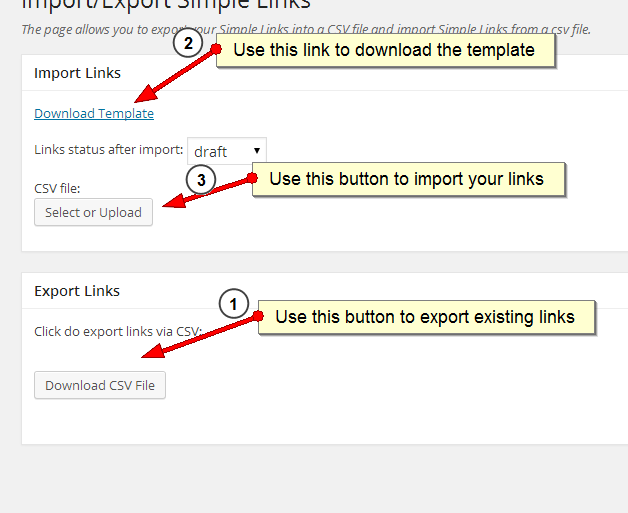 To download the template to use when creating your csv to import use the link by number 2. Once you have filled out the template with your new links use the button by number 3 to upload and import your file. There is currently nothing to configure here. Links will automatically appear in search results.